The long, hot days of summer are drawing to a close and fall is just around the corner. People eat popcorn year round these days, but delicious, healthy popcorn becomes even more popular when the nights grow long and the weather starts to turn nippy. Fall is the perfect time for a popcorn fundraiser. Moreover, popcorn fundraisers have become one of the most popular types of fundraising events today. Schools, clubs and organizations of types and sizes are turning to popcorn gifts for their annual fall fundraiser because customers love it so much it practically sells itself! Popcorn Palace is the premier gourmet popcorn gift provider. The Popcorn Palace offers more than 18 varieties of nutritious tasty popcorn, all available in resealable bags or seasonal decorative tins. Any popcorn aficionado will tell you Popcorn Palace has been all about flavor for 15 years. We use only premium ingredients – U.S. Grade AA butter, C&H brown sugar, roasted nuts (including whole macadamia nuts), real fruit oils, and even genuine Oreo® cookies. Moreover, all of our flavors are perfected by the toasty crunch of our freshly popped gourmet popcorn. Popcorn Palace has been featured on Unwrapped, $40 a Day with Rachael Ray, Roker on the Road with Al Roker, on the Food Network and as a part of Modern Marvels on The History Channel. We have also been ranked as one of the fastest-growing in the Inc. 500 list eight years in a row for the U.S.-based, privately held independent food & beverage company category. Thinking about popcorn fundraising events a month or two before a fall-themed holiday is a great idea as everybody is starting to think about their favorite autumn and holiday foods. Family members, friends and neighbors are simply more likely to be enthused by the thought of gourmet popcorn this time of the year. You can’t go wrong with a fall fundraiser with Popcorn Palace. Our flexible fundraising program is perfect for organizations of all sizes, and everybody loves our sweet or savory gourmet popcorn! Almost everyone loves popcorn. What’s not to like about an inexpensive whole grain that can be combined with virtually any flavoring to create a delicious, healthy treat? Popcorn is almost as American as apple pie. Popcorn originated in North America, hit the big time in the late 19th century, and exploded in popularity with the advent of the microwave oven in the mid-1970s. Popcorn was no longer just a treat at the movies. Suddenly popcorn was in every living room, office break room and school. Popcorn gifts, popcorn fundraisers, you name it, the American public had become totally enamored with popcorn. As the number one popcorn consuming nation, the U.S. consumes more than 16 billion quarts of (popped) popcorn annually. That means every American consumes close to 52 quarts of popcorn a year. The corn that popcorn comes from is a member of the grass family, and is scientifically known as Zea mays everta. There are six major types of corn—pod, sweet, flour, dent, flint and popcorn—but only popcorn pops completely when heated. The moisture content of popcorn is ideally between 13% and 14.5%. Popcorn will not pop properly with much higher or lower moisture levels. The two main types of popcorn relate to the typical shapes when it’s popped: snowflake and mushroom. Snowflake popcorn is commonly found in movie theaters and stadiums because it pops up bigger. Mushroom popcorn, on the other hand, is used for popcorn confections and popcorn gifts because it is stronger and won’t crumble as easily. Popcorn has a thicker hull than most other types of corn kernels. The thick hull means pressure from the internal water will build when heated and the kernel will eventually burst open. The inside starch becomes gelatinous during the heating process, and when the hull pops, the gelatinized starch is forced. The starch almost instantly cools into the familiar popcorn shape we all know and love. Popcorn is grown on almost 1,000 farms on more than 201,000 acres in 29 states (2007 data). The biggest popcorn producing states today are Illinois, Indiana, Iowa, Kansas, Kentucky, Michigan, Missouri, Nebraska and Ohio. Popcorn production in the U.S. has almost tripled over the last four decades. According to the Popcorn Board, the U.S. produced around 350,000,000 pounds of popcorn in 1970, and broke the billion pound barrier for the first time in 2013. Of note, the vast majority of U.S. popcorn production is contracted in advance with processors. Given these contractual arrangements and generally thin markets, popcorn is usually grown under irrigation. According to IbisWorld market research, the U.S. popcorn industry brought in more than a billion dollars in revenue in 2013. Well over three-quarters of U.S. popcorn production is consumed domestically. Although it’s difficult to measure exactly, most sources agree that away-from-home popcorn consumption represents less than one-third of overall popcorn consumption. New FDA rules aimed at removing junk food from school have banned many types of fundraisers such as candy, chocolate, and cookies. They won’t be allowed to be sold during school hours. All too often, fundraisers today revolve around these super-sweet foods. There’s nothing wrong with a tasty sweet for dessert or an occasional pick-me-up, but regular snacking on sugary food is unhealthy, especially for kids. One of the best ways to make sure children are eating reasonably healthy is to provide them with healthy snacks. A couple of servings of apples slices, carrots or popcorn can make a big difference in the nutritional status of pre-teens who try to live on burgers, fries and pizza. Fruit fundraisers replace unhealthy candy and cookie dough fundraisers with fresh fruit delivery. Offering your friends and family delicious fresh fruit is a great new way to raise money, and you have lots of options and price levels to choose from for your fundraiser. You can sell seasonal fresh fruit year round or just once or twice a year for special campaigns. Fruit is healthy and tastes great, and fruit basket gifts are unique and fitting for any occasion. Another healthy alternative for fundraising is selling meats and cheeses or meat and cheese gift baskets. Gourmet food products are one of the fastest -growing categories of gift baskets, and you can order a bewildering array of delicious domestic and imported food items in gift baskets today. Traditional food gift basket items like summer sausage and cheddar cheese remain popular, but olives, pates and savory jellies are also hot items for fundraising food baskets. Premium popcorn and popcorn gift baskets have become a hot fundraising idea today. How can you go wrong with a healthy, delicious product like popcorn in a variety of tasty flavors? Working with an industry leader like Popcorn Palace for your popcorn fundraiser means less work, more money and happier customers. Your friends and family can select from more than a dozen lip-smacking good flavors of premium popcorn when they participate in your fundraiser. Moreover, there are no upfront costs and your organization clears 50% net profit on every sale. There is no minimum order at Popcorn Palace, and best of all, you’re selling a delicious product that practically sells itself. Two, four, six, eight! Who do we appreciate? 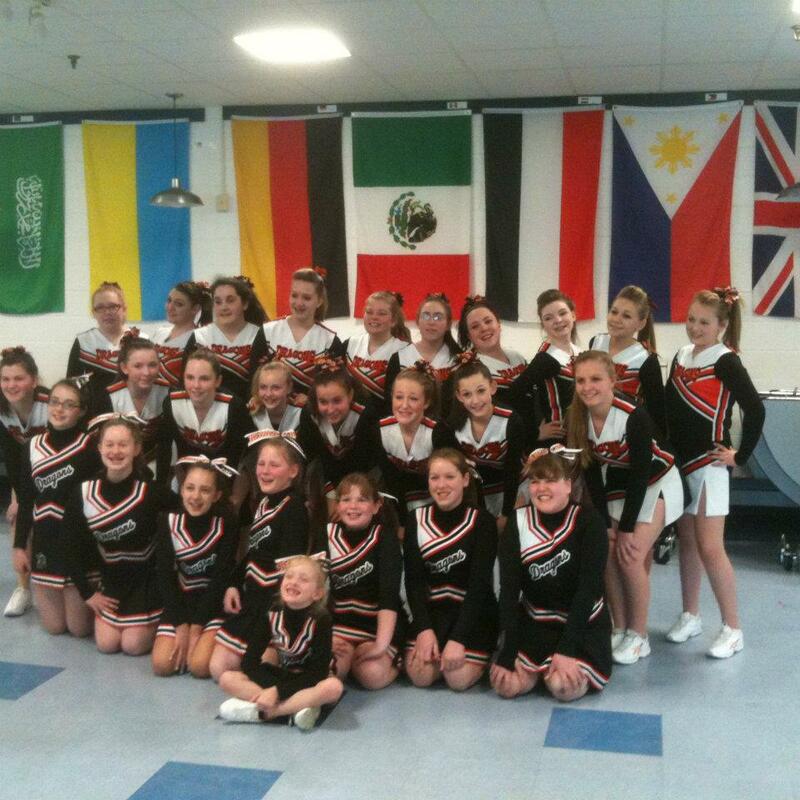 Cheerleaders are the lifeblood of a sports team, providing pep, excitement, and team spirit to any game. The Brunswick Area Youth Football League (BAYFL) was originally started by a group of individuals to get middle school aged children prepared for high school football. As the league grew in size and scope, a group of moms put together a cheering program so the girls could be involved as well. The profits from the fundraiser will go to the squad and to St. Jude’s Children’s Hospital.